Some reports refer to this unusual diamond as the "Eugénie Blue" although it is now recognized that there is no evidence of its having been owned by the Empress. Had she owned it, wouldn't she have chosen to flee with it rather than the diamond which is named after her? 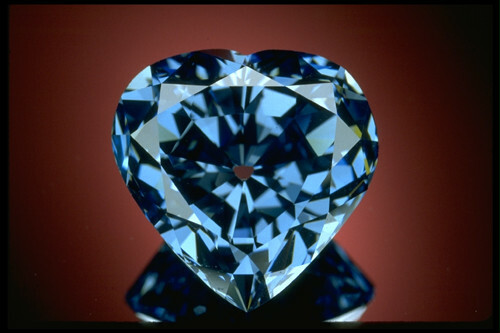 However, a French link does exist because the cutting firm of Atanik Ekyanan of Neuilly, Paris cut this heart shape, which weighs 30.82 metric carats and is of a rare deep blue color, sometime between 1909 and 1910. This date raises the question whether the rough stone came from Africa or India. it was put back into the ring setting sometime after the photo was taken. The stone measures 20.01 mm wide, 19.99 mm tall and 11.89 mm deep. In 1910 Cartier purchased the diamond and sold it to an Argentinian woman named Mrs. Unzue. At the time, it was set in a lily-of-the-valley corsage and remained so until Van Cleef & Arpels bought the gem in 1953. They exhibited it set in a pendant to a necklace valued at $300,000 and sold it to a European titled family. In 1959 Harry Winston acquired the gem, selling it five years later, mounted in a ring, to Marjorie Merriweather Post. 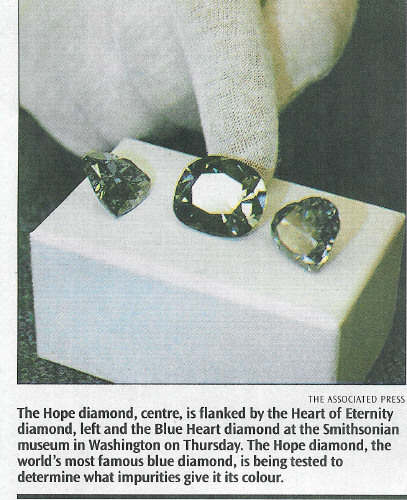 Finally Mrs. Post donated to the Blue Heart to the Smithsonian Institution in Washington D.C. where it remains to this day. 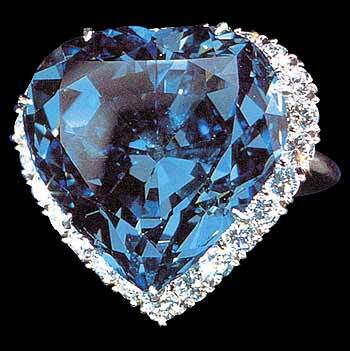 The Eugenie Blue Diamond among other diamonds in the Smithsonian's collection. The round yellow diamond in the back weighs about 12 carats. The Shepard Diamond is the large yellow cushion shaped stone, weighing 18.30 carats. The round brilliant white diamond is the Pearson Diamond, weighing 16.72 carats. 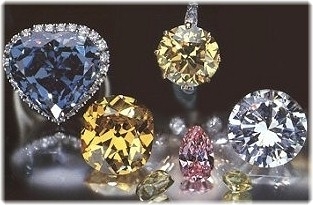 The pink pear shape weighs 2.86 carats, and the two uncut green diamonds weigh 2.05 and 0.97 carats. The round yellow diamond weighs about 12 carats. Sources: The National Gem Collection by Jeffrey E. Post, Famous Diamonds by Ian Balfour and Diamonds - Famous, Notable and Unique by GIA.